With a book in hand and an audience of youngsters on the floor around his chair, Hagerstown Police Chief Victor Brito was prepared Tuesday to read to students in Ashley Hobbs’ first-grade class at Jonathan Hager Elementary School in Hagerstown. But before he could start “Montana the Police Horse,” he kept a smile while answering the students’ many questions about his job, local crimes and police work. “This is the best part of my day,” Brito told the students. Officers from the Hagerstown Police Department and the Washington County Sheriff’s Office were at the school first thing in the morning. 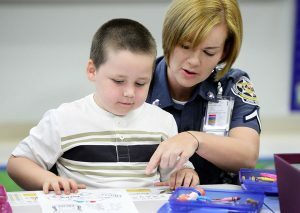 They were part of “Cookies with Cops,” the brainchild of Lisa Teach of Re-Max real estate in Hagerstown. On Tuesday, it meant working with local police officers and educators to get the books, the cookies and the time for the meetings with Hager’s kindergarten and first-grade students. “We’re excited to have them here because a lot of the students have been talking about things that they read in the newspaper about the police, and things that are happening around the United States, and we wanted to make sure we build relationships with the police, that they understand that the police are their friends, that they’re here to help,” Hager Elementary Principal Kathy Stiles said. “So I think they’re really excited. There’s a lot of students who want to be police officers when they get older, so we’re excited to have them here today,” she said. Law-enforcement officers shared that view. Teach said Tuesday’s meetings could be just the beginning of a larger effort. “We’re hoping to make our way to every elementary school in Washington County,” she said.